Nintendo's Satoru Iwata thinks latency will spoil cloud gaming's future. Satoru Iwata, Nintendo's boss, has put it on record: consoles are here to stay, and cloud gaming isn't all it's cracked up to be. In a Q&A held in the wake of Nintendo's financial statement, Iwata made it clear that dedicated gaming platforms won't be dying out any time soon, not if Nintendo has anything to say about it. "What do you think gaming will be like in the near future?" asked an investor. Cloud gaming's all the rage, and the questioner wanted to know whether Nintendo had any intention of moving in that direction, or perhaps keeping handheld devices but dumping dedicated gaming hardware. Iwata made it clear that he doesn't see cloud gaming taking over. "I would like people to understand that there are certain things that cloud gaming cannot achieve," said Iwata, arguing that latency will always be a problem, particularly for action games. 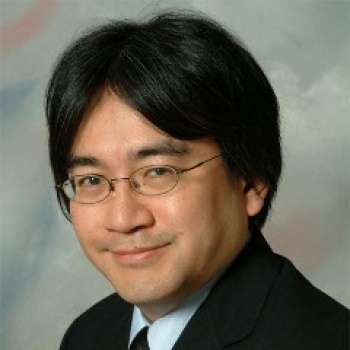 "There are many things that cloud gaming cannot do by design," Iwata went on to say, "but this fact has not been communicated well to the public, and I find it strange that many people claim that cloud gaming is the future." Meanwhile he sees Nintendo as a company determined to make sure consoles never die out. Nintendo does intend to streamline its production processes, so that different devices share the same methods of production, operating systems and software, so as to make porting games from one system to the other that much easier. However even that won't solve all problems. "If we try to linearly pursue this direction," says Iwata, "software development will become so complicated that we will eventually face a situation where cost recovery becomes a serious issue. Therefore we feel that we are nearing a saturation point in terms of simply improving performance or enhancing graphics." It could be, Iwata believes, that the time has come to start pursuing other avenues of game making, creating entertainment out of elements that people just don't expect to see in a videogame. As to what those elements might be, Iwata didn't elaborate, but in another question regarding Wii U architecture, Iwata did say that Nintendo's in-house teams were forging ahead with its new console. Iwata went on to directly link Nintendo's promise of a Â¥100 billion operating profit in the next fiscal year to the Wii U's development.